All suites feature large en-suites with shower, sea views, access to the deck and spa, TV, video, Internet, picnic gear, robes, massage (by prearrangement), breakfast and BBQ facilities. Prices quoted are per night in New Zealand dollars and include GST. No deposit required, only credit card details. Our accommodation suites feature either superking(splits into 2 singles) king or queen beds and sleep up to two guests unless otherwise mentioned.Checkout our lovely suites below for bed configuration. 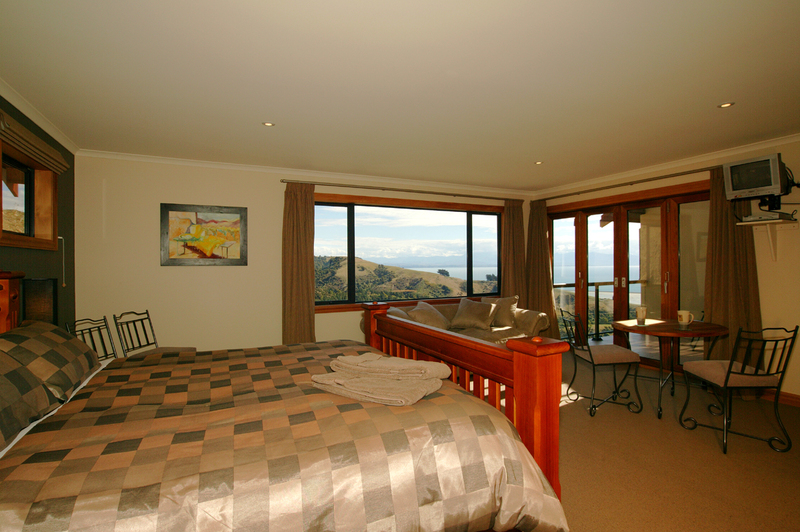 The Koru Suite – Treat yourself to views of Mount Arthur and Tasman Bay. Step out the wooden French doors onto the deck to relax and enjoy tea and coffee at your leisure. This Suite features a queen bed. Enjoy waking to the sound of the birds, the crisp views of the hills or the stunning view of the sea. 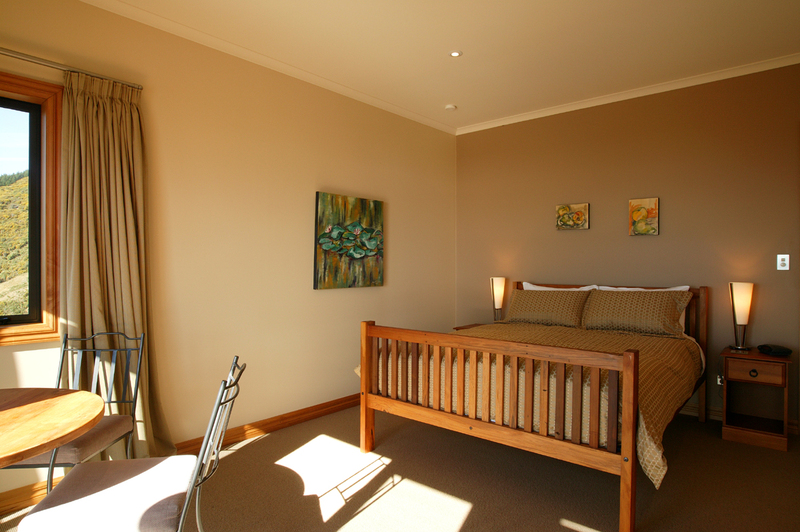 The Pukeko Suite offers all of this and more. Fill with early morning sun lasting till it sets over the ranges beyond, the Pukeko Suite provides all the pleasures and privacy of a corner Suite with a queen bed. 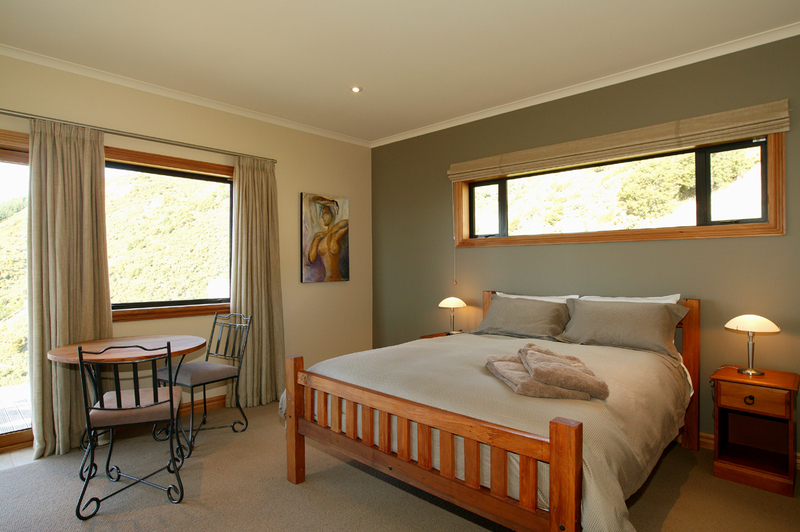 Nestled into our garden with views over the orchard as well as the sea, the Feijoa Suite offers a slightly more private access to our front decks for morning lounging.This suite features a superking bed which can split into two singles. The largest of our Suites, the Harris Suite has its own private deck looking over the vineyards, the sea and Mount Arthur beyond. This Suite features a King size bed, an additional couch to lounge in or make into another bed, and sleeps up to four guests.